Dave and Kim have been best friends for over 25 years. 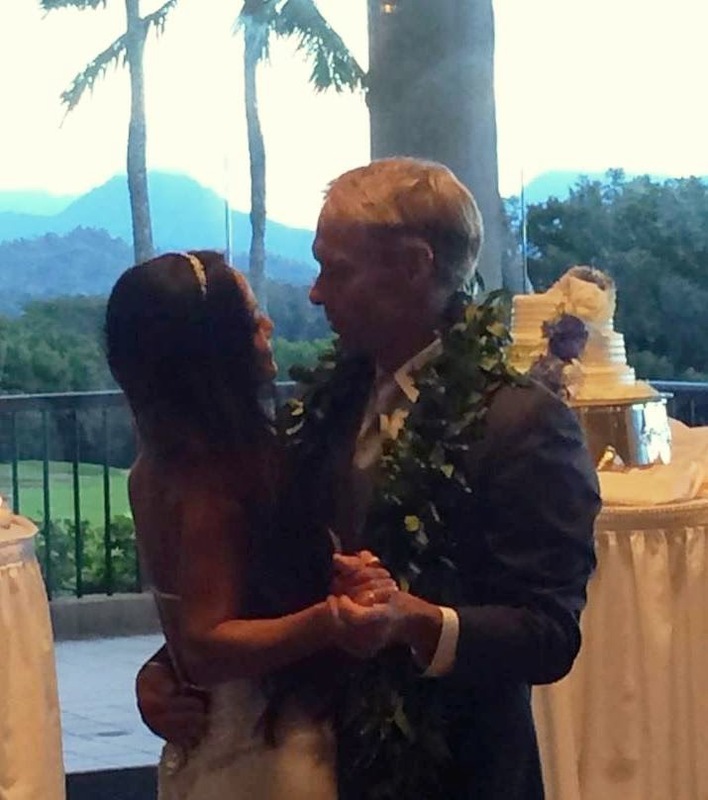 They have stayed in touch for all that time, and last night they made their permanent bond at the Koolau Ballroom. There were pictures at the sign-in table: one from when they met and one from the present. But everyone commented that they look the same! They met as flight attendants many moons ago, and Kim is still with Continental/United, residing until recently in Florida, I think. Dave left the Chelan PG Nationals partway through to help her move to Hawaii. She's a keeper because she actually told him to stay and finish. But Dave left to help her anyway, so clearly she means a bunch more to him than the top finish at the Nationals for which he was destined. Kim has been at a few of our monkey gatherings, and thankfully she survived. I think she might actually like our group, seeing as she allowed some of us to attend this blessed event. Seating was limited, so only a small barrel of monkeys were selected. I have slept with Dave so I got the nod. Dave has had a banner year so far. He is still one of our top guns in the air. And he was promoted to Fire Captain this year. Now Kim is the icing on his cake. Alex and I did take a peek outside the ballroom to look at the Koolaus. We usually don't get this perspective, and as much as we would enjoy flying over and across them, this view was majestic. The Koolau Ballroom is on the Koolau Golf Course, and is tucked up next to the Koolau range just north of the Pali lookout. A few pilots have had to land there over the years, and the crew has always been receptive. It's a pretty tricky spot, and the only reason for ever landing there is if the wind dies out. I don't think you would want to try it on a strong day because the trees are high it could be rotory. Okay, I snuck some flying information in there to keep this log related to flying. But of course this story is about Dave and Kim. And seeing as there has not been any new ink for a few days, I want to make sure this event is well represented. Oh, and to clarify my earlier remark: Dave and I, along with Kaaawa Larry, and an occasional bear, were tent mates in Pemberton during the Canadian Nats a few years ago. Flying is not all that we do well. We also can get a little crazy after being subjected to liquid courage. As the sun set, the monkey business started, and continued until closing. We were all dancing and having fun. I tried to steal the bride, but didn't get too far under Dave's watch. 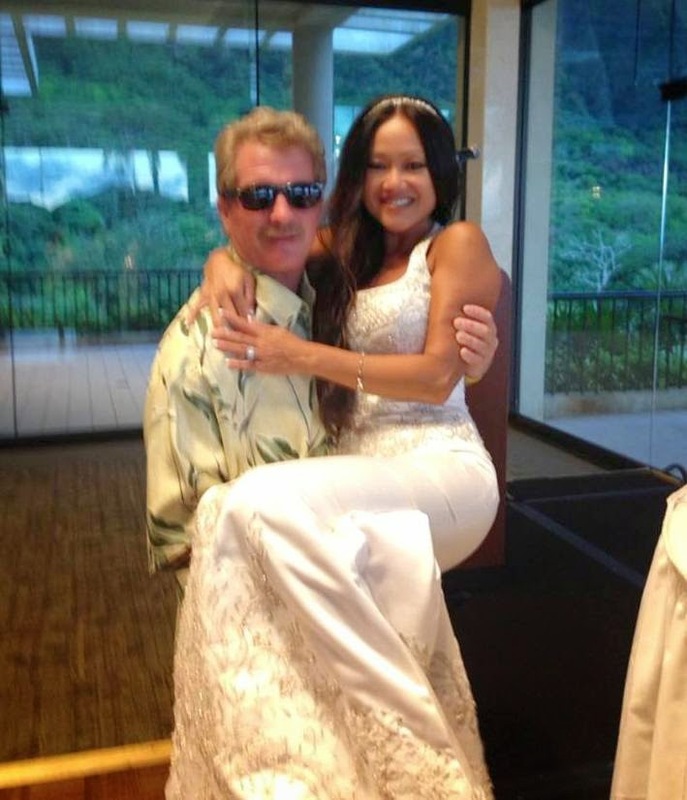 Congratulations, Dave and Kim. Kim, you have met some of us, but our gang is huge, and we are a pretty tight group. A wise man once said of us: you're a group of flawed individuals that together just seem to make it work. I know we will all love having you around, and I hope our flaws will be acceptable. Most are pretty laughable. Welcome to the family of the HPA. Thom: thanks for the kind words, you and Donna were awesome. I would loved to have invited everyone, but we had so many people from out of town and I have many social circles: paragliders, firemen, the old surf crowd, airlines,etc. It was great to see everyone and we will all get together later. See you in the air. I am planning on getting out there more now. I don't seem to be able to type very well this morning. Thanks everyone. Congrats to you both and welcome to the family Kim! Great writeup, Thom! What a great story. I am very happy that Dave and Kim are finally together after all that time! Some things are worth waiting for. Very Happy for both of you. Wish I could have been there with all of the invitees but I'll catch up soon. The Pemberton trip was one of the highpoints in my life but I don't usually tell people that I slept with two other guys there. I usually say we camped together. Thanks Thom, you've opened us all up to even more ridicule than usual! !